Pajhwok Afghan News Weekly Price Report-Food items’ prices decreased during the outgoing week in Kabul, where the rates of gold and fuel edged up, retailers said on Thursday. 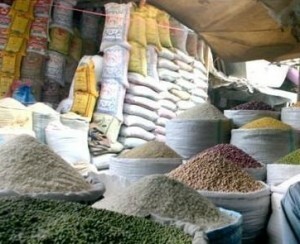 Food Traders’ Union head Fazal Rahman said the price of a 50-kg sack of Pakistani rice fell from 3,360 afghanis ($63) to 3,300 afs and 49-kg sack of flour from 1,130 afs to 1,120 afs. He told Pajhwok Afghan News the price of a 50-kg bag of sugar fell from 1,620afs to 1,600afs and a five-kg tin of Momin ghee from 400afs to 390 afs.Rates of other food items remained stable, with a kilogram of African black tea priced at 200afs and Indonesian green tea at 175afs.But wholesale prices varied from retail rates in some parts of the city. Khan Ali, a shopkeeper in the Karta-i-Seh locality, sold a 50-kg sack of Pakistani sugar for 2,100afs, 49-kg flour bag for 1,180afs, 50-kg rice for 3,700afs and a five-kg tin of ghee for 460afs. The rate of one litre of diesel jumped to 58afs from its last week’s price of 55afs and petrol from 55afs to 56afs, said a filling station worker in the Taimani neighbourhood, Mohammad Javed. The price of per 560 kilograms of peeled oak fell to 6,800afs from last week’s rate of 7,400afs. The same amount of cedar accounted for 6,600afs, the same as last week, said a stall owner in Dasht-i-Barchi locality, Haji Sultan.A kilogram of liquefied gas sold for 45afs, said Ahmad Sharif, a dealer in Taimani neighborhood. The same amount of gas accounted for 40afs in other parts of the city.Abdul Basir, a jeweler in Lycee-i-Maryam area, said the price of one gram of Arabian gold soared from 2,300afs to 2,350afs and the Iranian variety from 1,850afs to 2,000afs. He linked the increase to international market trends.Moneychanger Ahmad Shah said the buying rate of a US dollar was 52.90afs, while 1,000 Pakistani rupees accounted for 530afs. Last week’s exchange value of the dollar stood at 52.75afs and 1,000 Pakistani rupees at 527afs.